When it comes to your personal credit history, it pays to understand and know your score. A free Credit History Lesson from Dupaco will teach you how to drive up—and maintain—your credit score, consolidate debt, and pay less. 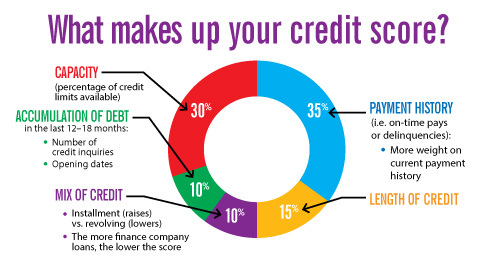 What does a credit score mean to you? It's important to understand how to maintain your credit score so when it comes time for you to borrow money—for a home, car or to pay for college—you may qualify for the lowest possible interest rate. Also known as FICO, this number is calculated by credit bureaus and can range from the 300s to the 800s. Credit History Myth: A poor credit score will haunt me forever. False. A credit score is a “snapshot of an applicant’s potential risk at a particular point in time.” Scores fluctuate with time and changes in your credit performance, with the heaviest weight being given to your most recent credit activities. Past credit problems fade as time goes by and recent positive data accumulates. Regardless if you have had past credit difficulties, are trying to establish credit in the first place or simply checking up on your credit report; Dupaco offers free Credit History Lessons, which can help you reduce interest rates, eliminate fees and get–and stay–on the road to financial success. During a Credit History Lesson, we'll sit down with you to review your credit report and provide confidential coaching tips on how you can improve your score. That's right—we're a financial institution that will continually teach you ways to drive up your score and pay less in interest. Schedule your free Credit History Lesson today! Fill out the form at the bottom of this page or give our Member Service team at call at 800-373-7600 / 563-557-7600, ext. 206. Stay on the right track for a financial future that's bright. Dupaco's newest service, Bright Track, provides you access to your credit score and full credit report as well as tools to help you improve your score—accessible to Dupaco members now within Shine Online Banking! Bright Track is available to you as a free benefit of your credit union membership. Not a member yet? No worries! Open a membership with Dupaco at any branch or by joining online. Once you are a member, you can benefit from the many products and services that Dupaco has to offer, including Bright Track! On what day of the month does Dupaco report credit card payments to the bureaus? Hi Tara, we report on the 3rd or 4th of the month. It can take a couple of weeks for the payments to show on the credit bureau due to the bureau taking time to verify the information.